Archive for monkeys saying BOO! Cutline was sold a few years ago and had a more restrictive license placed on it. The original author of the Cutline theme has gone on to produce other themes with more restrictive licenses. Using Cutline has been seen as a promotion of that work and that’s not something we want to do–so, we made something better: Coraline! So yeah, by the sounds of it they’ve tarted up Cutline with some code from the new default, changed a couple of letters in the name and are calling it a new theme. I’m not really sure why they chose the theme in the first place if it’s such ‘junk’, and I fail to see why existing users have to be screwed around. If you hate it so much, couldn’t you just deprecate it by making it unselectable as a new theme? Come to that, why do we still have three versions of Sandbox cluttering up the place? 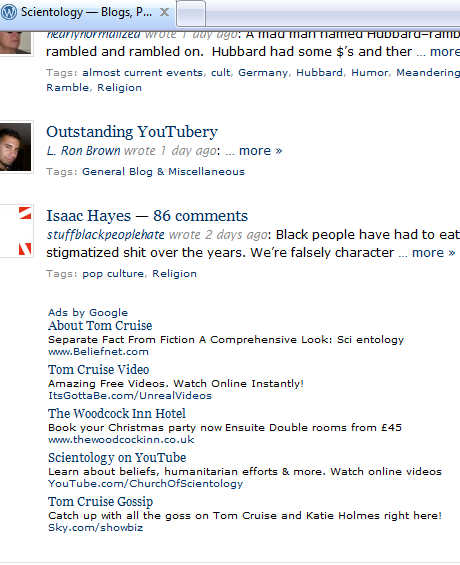 I can’t see what’s so difficult about hiding a theme option without removing it from existing blogs. All you would have to do is add a BIG WARNING to the theme description saying that the theme is deprecated, it is recommended that you upgrade, and if you do change themes, you will not be able to get the old one back. Simples! And then I would no longer be troubled by the continuing existence of Sweet Blossoms. [ETA: unsurprisingly, though it was a surprise for them since evidently not all Cutline users lurk in the CSS customisation forum, existing users are not massively pleased about the whole being screwed around thing. I don’t really have time for this (I am meant to be NaNoing) but, yeah. Here we have somebody getting banned from the forums for wanting their personal information removed from someone else’s blog comments, and wondering why staff were willing to do this a year ago yet not anymore. I suppose we should be grateful that these blowups aren’t as frequent as they used to be. I’m not sure which is worse: leaving RL information up for the world to see or poking around in other people’s comments, but having had my comments messed with in the past I would probably agree with the most recent line that it’s the latter. I still have no idea why people are never warned before they get banned from the forums. I’m not talking about obvious spammers; I’m talking about people who get censored purely for questioning policy. How long would it take to write a post saying ‘While you are welcome to ask or answer support questions on this forum, if you post about this subject again your account will be blocked and you will no longer be able to receive support from this source?’ I don’t know, a minute, maybe two. Anybody who’s ever watched Supernanny knows that you issue the warning before you dish out the punishment. I think they’re worried that if they give a warning the person might actually comply, and then they wouldn’t experience the pleasure of wielding the banstick. Power corrupts, and that. 1. The tag cloud. I know they’re sooo 2007, but it kids people into thinking you care about the long tail. Tags going from the front page is on the surface an odd decision considering how important tag pages are to ad revenue, so I’m wondering whether they got some kind of warning from Google about their SEO gaming? like ‘you can keep the obfuscated links in themes if you stop linking from the front page’? Or maybe they want to encourage internal users to use search instead of clicking on tags, so that the majority of tag traffic comes from outside the site and improves the ratio of clickthroughs per pages served? I’m just thinking aloud here. I know nothing about adsense optimisation or SEO, except that every design decision on a commercial site is ultimately motivated to maximising ad revenue, which is increasingly hard to come by nowadays. Also, of course, presenting yourself as the home of eleven VIP blogs and ignoring the messy penguin-ridden millions isn’t going to hurt when it comes to luring businesses away from Typepad. I am now so enraged by the mysterious disappearance of my beloved roll-eyes smiley, and the replacement without notice of ALL existing smilies with anaemic substitutes and the lack of any response to my bug report concerning same, that I need all you logged-in people to go along and rate this FAQ as Very Poor, at least until it stops telling lies. != . 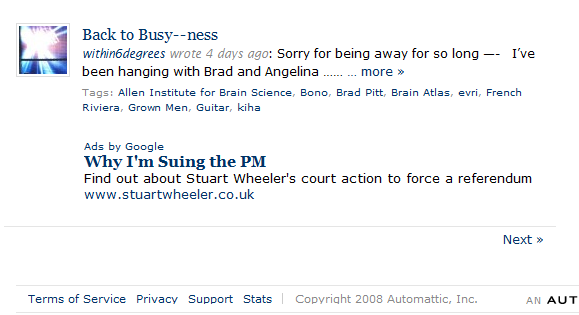 Would you go into my blog and change the font or header image without my say-so? No, you would not, so quit messing with our content and give us the option to choose the old smilies. We know they are not things of great beauty and they do not match the floofy backend, but at least you can see what they’re supposed to be. Theme tags don’t paginate properly. http://wordpress.org/extend/themes/tags/fixed-width/page/2 throws a 404, making it unnecessarily difficult to browse themes. Either scrap the page links or make them work. My preference is for the latter, as ideally I would like to be able to view more than 15 themes in any given category. Also, as I’m sure you’re aware, search results display diagonally rather than vertically or even horizontally (http://wordpress.org/extend/themes/search.php?q=widgets). I applaud your willingness to try new ways of presenting information, but on the other hand it does look depressingly like somebody forgot to clear their floats. If I were logged in on my usual account there’d be screenshots and debugging. Sigh. I am not normally this snarky in my bug reports, but a) they had a year to get this right, b) it’s a part of the site used by designers, and not bothering to test whether your own design functions properly is sort of rude, to be honest, as it betrays once more how very little you care about their vocation and c) I can’t view more than fifteen themes in any given category?!? are you real? In case you missed today’s bout of penguin spam, I’ve archived it for your viewing pleasure here. If you or your family live in the US and have been personally affected by the issue of allowing children to blog here without parental consent, you may be interested to learn that the FTC have made it much easier to file a complaint about COPPA violations. If you are a staff member of Automattic, they have produced a useful checklist to help you comply with US data protection law and pre-empt any such complaints here. Perhaps once they have ensured that they’re not going to get hammered with a fine they will be less afraid to deal with children when they misbehave. Right now, when they ban a child they run the risk that they or their disgruntled parents are going to grass them up and let them in for a world of pain. Taking personally identifying information from children and claiming to be unable to delete it? Inadvertent pron on kiddy dashboards? Ads for dating agencies on kiddy blogs? World. Of. Pain. It’s a good thing that penguins and their guardians are neither that smart nor that malicious. did akismet break or something? This is unacceptable. Automattic want to control who gets to comment on my blog. Even spam gets sent to a queue where I can approve it if I want. Hence, I have emptied the contents of my Akismet queue onto my front page, since it is clearly more acceptable to our hosts than comments from my readers. I was going to write a post about how it might be a good idea to carry out usability testing before a major admin redesign rather than after, and how it might also be sensible to rip off the Tiger interface before paying Happy Cog to make you something custom, but it will just have to wait. 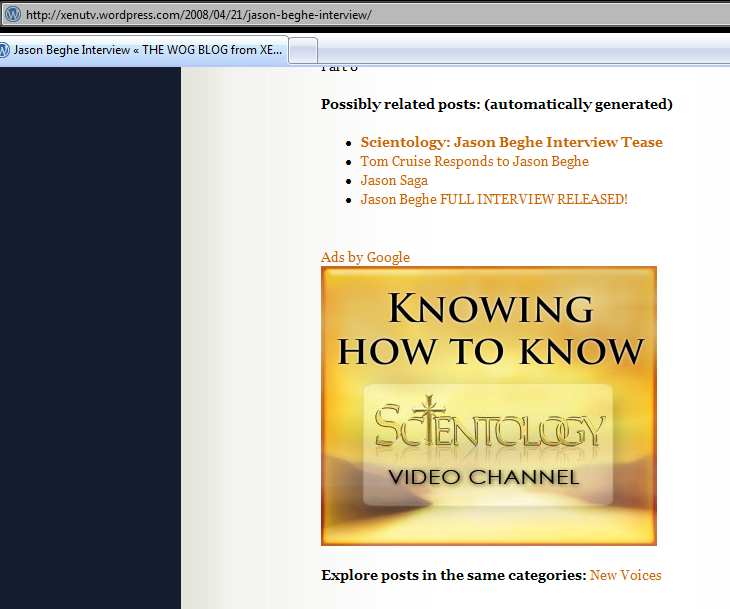 I know that nothing this mob do should surprise me anymore, but when options posted a screenshot of wordpress.com showing Flash ads for Scientology I admit it, I was shocked. Also, if you’re bored of linking to the last set of splogshots, how about some wildly inappropriate text ads? Obviously I would have contacted support immediately to demand that the Thetans not be given airtime on my blogs, except oh, it’s Sunday, and even though they hired a bunch of support staff what, five months ago now? support is still closed on weekends. And I can’t post to the forum because I once asked Matt whether his email was down. I did send a couple of feedbacks to Google, though. For all the good that’ll do. At least they pretend to care. Also of note: Snap = popup ads disguised as a ‘feature’. Anyone know why neither this nor the Flash are mentioned in the tiny little chunk of disinformation hidden at the bottom of the features page? Or why they decided to encrypt the x-noads code that told us why ads weren’t being served on a given page? The obvious conclusion is that they’re tweaking their algorithms to serve ads to more readers more of the time, and they don’t want anyone to realise. And now? I’m going to clear out my spam, make my regular backup, and see whether anyone bothers coming over to try and spin this one. I wouldn’t, if I were them. If there’s a single issue that’s destroyed my trust in Automattic, I’d have to say it’s their repeated failure to be honest about the issue of advertising. I’m some months past believing a word they have to say on the subject. Even if it’s ‘sorry’. Actually, especially if it’s ‘sorry’.